Peplink Speedfusion: What is it? SpeedFusion. What is it? How does it work? How can it help my business? We’ve put this information all in one place to answer some of the most commonly asked questions about this exciting technology. SpeedFusion is Peplinks patented technology that powers enterprise grade VPNs. By tapping into the bandwidth of up to 13 low-cost cable, DSL, cellular, and other links, SpeedFusion turns your multiple connections into a single bonded connection. What can SpeedFusion be used for? SpeedFusion has three technologies designed to address specific problems. In the event of a WAN disconnection, Hot failover will transfer your traffic to another connection while maintaining session persistence. For example, if a WAN connection breaks during a video conference, the video conference can still continue without having to hang up or call again. 3Gstore utilizes SpeedFusion Hot Failover in our day to day operations at our warehouse. Our primary internet connections is a wired Comcast connection, and we use Verizon LTE as our backup connection. We’ve created a SpeedFusion Hot Failover connection and run all of our traffic through that connection. All of our data flows over the wired connection first so we don’t use any unnecessary cellular data, but the instant that the wired connection fails, Hot Failover seamlessly switches all of our traffic to the LTE connection. A traditional failover or load balancing router would lose all of the network traffic on the internet connection that fails dropping calls with our customers, interfering with our ability to ship products, and preventing us from running our business. Thanks to SpeedFusion Hot Failover, if an internet connection fails, no customer or employee is even aware there was an outage. 3Gstore holds quarterly ‘fire drills’ where we’ll purposely disconnect our primary connection to ensure our systems all function in the event of a real outage. WAN Smoothing utilizes intelligent algorithms to fill in connectivity gaps, trading bandwidth for greater connection resiliency. WAN Smoothing minimizes latency and reduces the impact of packet loss. This is useful for times when you need connection reliability and responsiveness more than speed. WAN Smoothing uses two or more internet connections simultaneously for the purpose of increasing reliability and consistency of a connection. If you can’t afford dropped packets or need minimal latency for applications such as live streaming audio/video, WAN Smoothing makes that possible. Bandwidth bonding combines data at the packet level, enabling you to combine the speed of up to 13 connections. This is useful for situations where bandwidth is scarce, such as at a remote site or in a moving vehicle. This technology also enables branch offices to connect to the head office at greater connection speeds. If you are opening a branch office in a location where internet connectivity is slow or unreliable, Bandwidth Bonding can save the day. 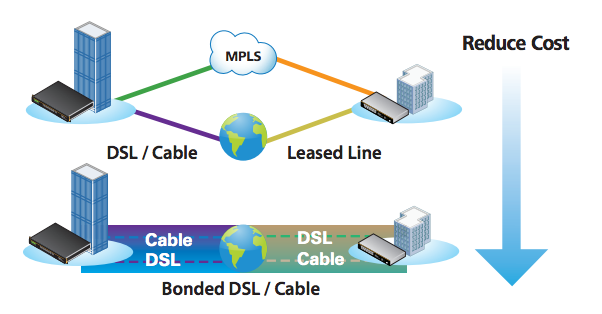 By bonding the speeds of multiple DSL lines, offices can experience increased reliability by utilizing multiple connections at once, and aggregate the bandwidth of multiple connections into one faster pipe. SpeedFusion Bandwidth Bonding is also a simple way to save money over high cost MPLS or fiber lines. Instead of paying for a direct fiber connection which can be thousands of dollars to install, and hundreds of dollars monthly for a slow connection, you can run multiple commodity DSL or cable connections and bond them. You’ll save money over the MPLS or fiber line, increase reliability by having multiple connections active, and end up with more bandwidth than those lines can provide! 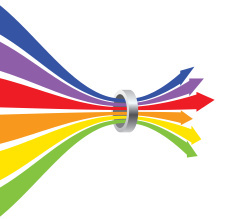 What makes SpeedFusion different from Load Balancing? Load balancing allows a single router to have multiple active internet connections, however load balancing has its limitations. First, load balancing doesn’t allow a single user to take advantage of the speeds of multiple connections. If you have three 10Mbps DSL lines, all a single user would ever see is 10Mbps. If the internet connection that user is being balanced to drops, that user would lose connectivity completely while the router fails them over to another available connection. VoIP phones would be disconnected, web sessions would sign out, and any downloads in progress would be dropped. Load balancing provides more bandwidth across an entire network, but does NOT combine the speeds of multiple connections or allow for session persistent unbreakable internet connectivity. Only SpeedFusion can provide this! For some users session persistence is not required and failover between multiple links of a load balancing router is enough. Peplink provides 7 incredibly powerful load balancing algorithms and customizable rules that put you in complete control of network data priorities. Just set your traffic priorities, including VoIP and custom application traffic with a few clicks and let Peplink take care of the load-balancing and optimization details. Peplink load balancing routers support PepVPN instead of SpeedFusion. 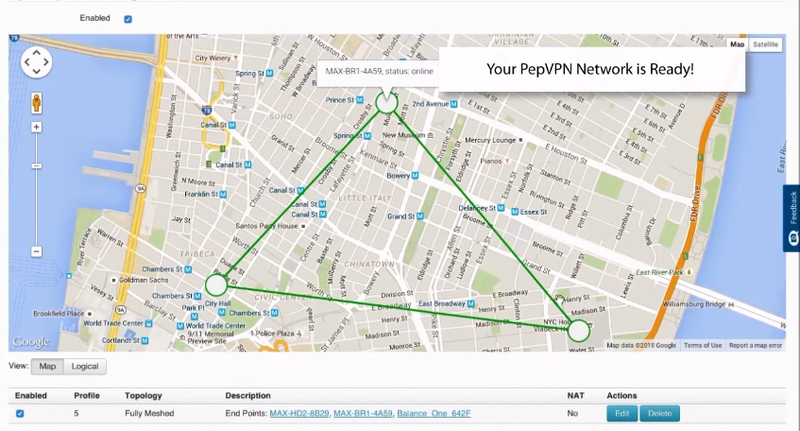 PepVPN allows a simple VPN connection to other Peplink routers, although without the benefits of SpeedFusion. Branch offices that don’t require SpeedFusion performance can still connect up to a SpeedFusion capable router at the headquarters and still participate in the larger mesh network for remote connectivity. What is required to create SpeedFusion Connections? In order to create a SpeedFusion connection you’ll need a minimum of two pieces of Peplink technology with SpeedFusion capabilities. This typically consists of a primary unit, installed at a headquarters or data center location with access to a high speed internet connection, and a second unit that is mobile (in the case of cellular bonding) or installed at a remote or branch office. A SpeedFusion VPN tunnel is created between the two locations, and using the powerful outbound policy settings on the Peplink router, all or specific traffic is routed over the bonded connection. Lets use the diagram above to show how SpeedFusion can make VoIP calls unbreakable for a business. The headquarters location has a Balance 710 router installed. Each branch office for the business located across the country gets a Balance router with SpeedFusion capability, spec’d based on the office size and throughput requirements. The remote office routers are easily set up to route all VoIP traffic over the SpeedFusion connection to the main headquarters router. Because each remote office has at least two internet connections, if one connection was to fail, VoIP traffic would seamlessly continue on the second internet connection uninterrupted! This sounds great, but is SpeedFusion easy to set up? Yes! SpeedFusion setup takes minutes, compared to the time and effort it takes to configure a typical VPN between multiple sites. The Peplink user interface is graphical with easy to understand options. Helpful icons provide more information where it is needed without making deployment a burden. SpeedFusion deployments are even easier when leveraging InControl 2, Peplinks cloud based management tool. InControl 2 can automate SpeedFusion deployments for hundreds of sites simultaneously in just a few minutes meaning you don’t have to configure each router individually! InControl 2 is free for the first year with every Peplink router, included with the extended warranty, or a low yearly cost per device. SpeedFusion and InControl 2 are part of a larger concept called SD-WAN (Software-Defined Wide Area Network), a revolutionary way to approach the simplification of branch office networking and assure optimal application performance by using centrally controlled and managed WAN virtualization. SD-WAN is WAN virtualization, which allows for intelligent, secure, and centrally managed and monitored connectivity. Read more about SD-WAN here. What if I want to take advantage of SpeedFusion but don’t have a second location for a second router? 3Gstore has created SimplyBonding for exactly those situations. 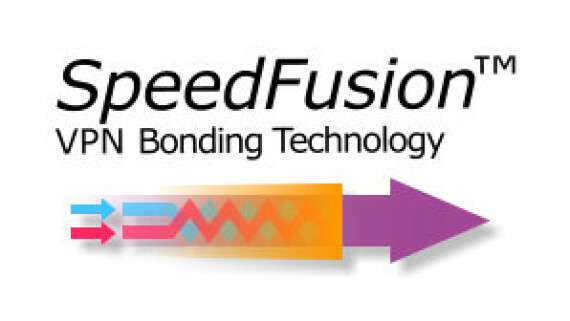 SimplyBonding uses Speedfusion technology to bond multiple 3G, 4G, DSL, or cable connections into one fast/reliable/unbreakable connection. Utilizing Speedfusion typically requires a Peplink router on both ends of the connection - one at the location where you need the bonded connection, and another at another location with a high-speed internet connection to bond the connections and send the data back to the primary location via VPN. SimplyBonding eliminates the need for this dual-router setup. SimplyBonding requires just ONE router, which will be configured to connect to our hosted service - WE handle the bonding and VPN for you! SpeedFusion Bonding does have limitations that are important to understand before considering a deployment. First, you must have enough bandwidth at the headquarters site, to support the total bandwidth of the remote site(s). Ex. You have a headquarters location with 50Mbps download, and 10Mbps upload speed. Your remote site has three 10/5 connections. 5 + 5 + 5 = 15 Mbps - 15% = 12.75 Mbps maximum upload speed. The headquarters only has 10 Mbps of upload speed available, so that is your upload capacity for the remote site if you are sending traffic to the internet. You still have the benefits of bonding for reliability, session persistence, and speed, you just can’t use the full capacity of the remote site links due to the bottleneck on the headquarters router connection. Cellular users should note that bonded cellular connections suffer from “flow control” of TCP traffic at the carrier level, and 3Gstore cannot guarantee that bonding multiple cellular connections will result in faster speeds (however, the other benefits of SpeedFusion bonding remain, such as unbreakable VPN, session persistence, and 100% uptime as long as you have 1 healthy WAN). Cellular users must also consider tower capacity if bonding multiple connections from a single carrier. For the best results, we recommend bonding no more than two of the same carriers connections together, favoring bonding multiple networks together instead to ensure the highest availability of bandwidth. At LiquidLayer.net, we’ve made a shared web hosting platform that’s both feature-rich and easy to make use of. Our programmers have built up a custom Linux cloud web hosting platform plus an innovative Control Panel that perfectly takes advantage of its capabilities. After long hours of programming and bug fixing on our end, we are now capable to guarantee that all of our shared web hosting services are safe, virus-free, full of capabilities and very easy-to-work-with. In addition, they feature 99.9% server uptime as well as 99.9% network uptime warranties.